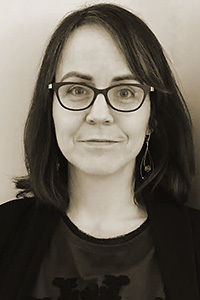 Sara Biggs Chaney is the author of two poetry chapbooks: Ann Coulter's Letter to the Young Poets (Dancing Girl Press, 2014), and Precipice Fruit (ELJ Publications, 2013). Her poems have appeared or are forthcoming in Whiskey Island Magazine, The Normal School, Hotel Amerika, RHINO, and elsewhere. She received her PhD in English from Indiana University and teaches at Dartmouth College’s Institute for Writing and Rhetoric. She is the poetry editor for Split Lip Magazine.